“What if I want ten-thousand. Literally. Ten Thousand.” Back when Wonder Dome was in full swing I had the great honor of meeting some of the folks from Concordia’s Topological Media Lab. While some of their folks were in residence with ASU’s school of Arts Engineering and Media. They’ve spent a significant chunk of time building a system that they call Ozone, which is largely powered by Max MSP and Jitter. While they were visiting with us at Wonder Dome, they had lots of questions about TouchDesigner, how it works and how it was working for us. We talked bout a number of different things that day, but my favorite moment came over lunch. We were talking about making surfaces, and the flexibility and challenges involved. After we had added a sphere to our network, one of the team members asked me “what if I want to make a lot of them. What if I want to make ten-thousand. Literally. Ten Thousand.” There are lots of ways you might do this, but one of my favorite ways to think about making multiple copies of the same object is with instancing. Instancing is a fun way to make lots of copies of a piece of geometry and to place those copies very specifically. On the face of it, that sounds a bit academic. Let’s look at a specific example to unwrap that idea a little bit. 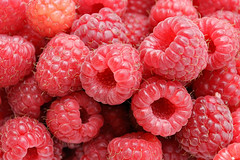 Let’s look at a raspberry. We can think of a raspberry in a few different ways. On the one hand it’s a small oval like berry. At the same time if we look closer we can think of this single object as an array of spheres tucked next to one another in a patterned way. Instancing, as a method, allows us to do something like this relatively easily and quickly. 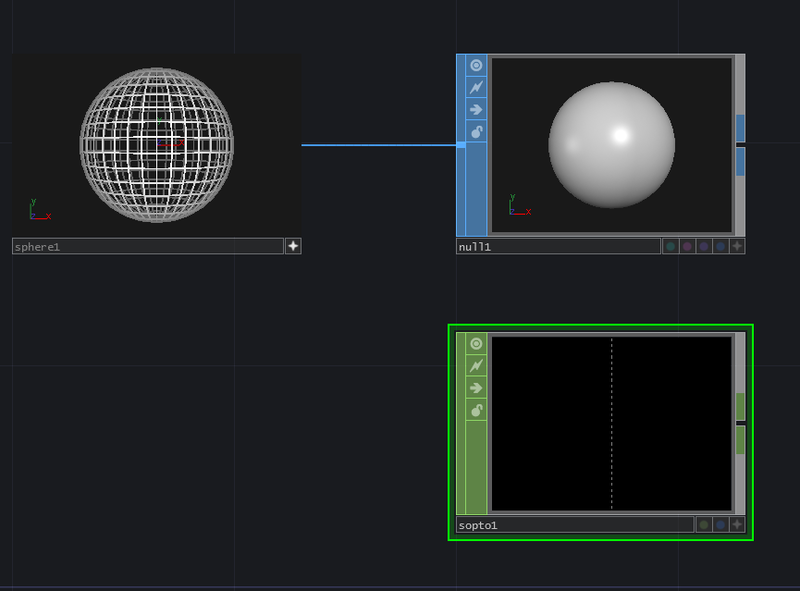 On top of that, it’s a ton of fun, and unlocks a whole new set of possibilities when it comes to creating geometry in TouchDesigner. So where do we start?! Well, we need to start by taking some time to do a little bit of thinking about how instancing works. For starters, instancing is something that you do to a Geometry COMP. As a component, we can do things with Geo’s that we can’t do with regular surface operators. 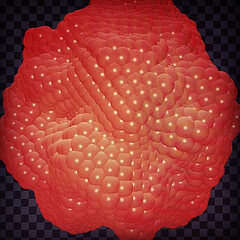 A Geometry COMP is also one of the main ingredients when it comes to rendering surfaces. First we’ll look at how we can work with the Geometry COMP, then we’ll talk about what that means when it comes to rendering. Okay. Let’s start in an empty network and create a new Geometry COMP. We could just work with the torus that’s in our Geo to get started, but let’s make a few changes so we have something that’s a little more fun to play with. Dive into your geo, and let’s get situated. 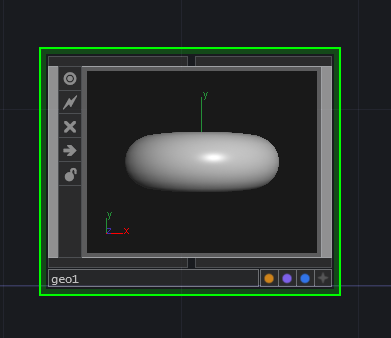 Inside our geo you should only see a single surface operator, a Torus SOP. You should also notice that there’s a little purple dot, and a little blue dot that are in the bottom right hand corner. These are two of the Operator’s flags – the purple dot is the render flag, and the blue dot is the display flag. Flags let you change the behavior of your operators in some interesting ways. The render flag, like it’s name, tells you if something is being rendered or not. Why not render something?! Well, you might find yourself in a situation where you need a SOP to help control the movement of another piece of geometry, but you don’t necessarily want that guiding element to be rendered. In this case you’d want to make sure the render flag is off. The display flag allows a SOP to be seen in the Geometry viewer. Like our other example, there might be a time when you don’t want to display a particular SOP while you’re making a change, in this case you’d want to make sure the display flag is off. There’s lots more to say about Flags, but that should be enough to make you dangerous. Alright, now that we know a little more about what’s happening in our Geo let’s make some changes. For starters, let’s delete the Torus, and add a Sphere SOP and a Null SOP. Let’s connect these two operators, and make sure that we turn on the display and render flags on the bottom right corner of our Null. While we’re here let’s change the name of our null to DISP for Display. Let’s also change the size of our sphere. In the radius parameter field lets change the three values to 0.15. Now when we back out of our Geo we should see our sphere instead of a torus. Alright. Now we’re going to add another sphere to our network, but this time at the same level as our Geo. Let’s also connect that Sphere to a null. The next part is gonna start to get funky, so let’s help ourselves out before the world starts to turn upside down on us. Head over to your sphere, and make it viewer active (hit the small + in the bottom right corner), next hit the letter w on your keyboard. 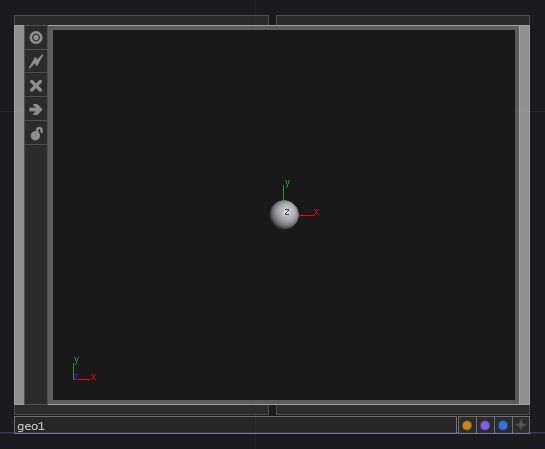 What you should now see is the wire frame of your Sphere SOP. Okay. Let’s just leave that be for now, but know that we’re going to come back to it so we can better understand what’s coming next. Now we’re going to add a SOP to CHOP to our network. The SOP to CHOP is a special kind of operator that allows us to change one type of operator to another. In our case, we’re going to change our null1 into CHOP data. To do this, we’re going to grab our SOP null1 and drag it on top of our CHOP sopto1. What manner of witch-craft is this?! Alright, what we’re looking at is the channel information from our SOP. Let’s think back to our wire frame Sphere for a moment. Each one of those intersecting lines represents a point. Each point has three values associated with it in terms of position – x, y, and z. Our SOP to CHOP is giving us a graph that represents all of those points. That’s awesome. Why is that so awesome? Because now we can instance like there’s no tomorrow. Let’s head over to our Geo COMP and take a look at a few things. If we look at the parameters of this COMP, we’ll notice a page called Instance. Click that bad boy. Here we want to do a few things. First we want to turn on Instancing. Next we’re going to tell our Geo that we’d like to use our CHOP called sopto1. 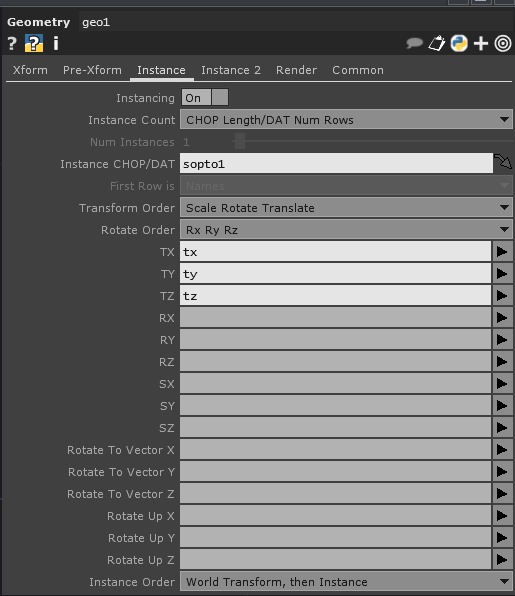 The last thing we need to do here is to help our Geo understand what to do with our CHOP data. In our case we’re going to tell the Geo to use tx for tx, ty for ty, and tz for tz – we’re matching up the location of our points from our Sphere to the points where we’d like instances of our geo. If that doesn’t make sense, that’s okay – for now follow along and this should make more sense soon. Now if we look at our network we can see some of the magic that’s happening with instancing. To get a sense of how powerful this really is, let’s go back to our Sphere here in our parent network. 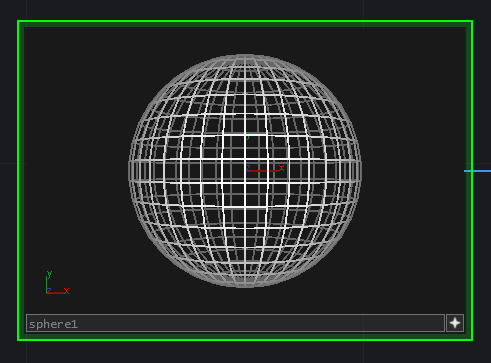 In the parameters page, let’s change this sphere from being drawn as a mesh to being drawn as polygons. We can now see that our instances are happening at each of the vertices of our polygon. Let’s try one more change to see how this powerful this is. For starters, let’s turn up the frequency count – I’m going to turn mine up to 10. Next let’s add a Noise SOP to our chain of operators between the Sphere and the Null. Now we’re starting to see some magic happen. At this point we’re now transforming the position of our instanced spheres with a noise algorithm that’s being applied to our original geometry. As a quick note, it’s important to consider that this is not the most efficient way we could have programmed this. 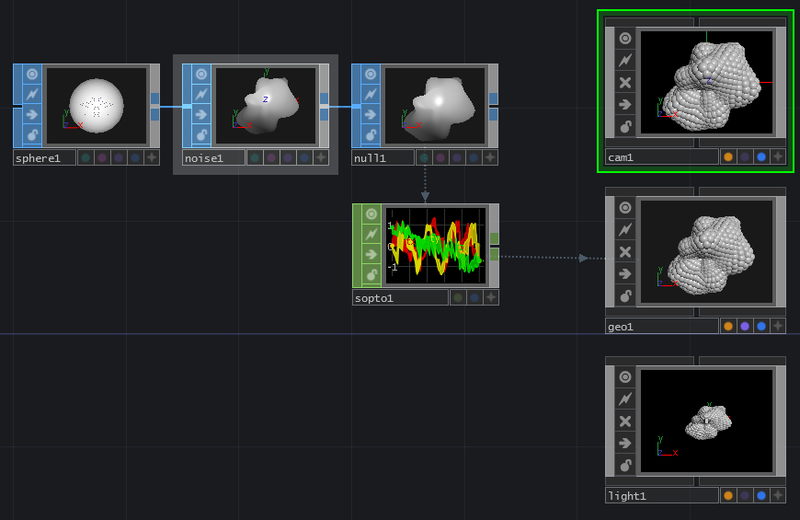 In TouchDesigner SOPs are a CPU operation, unless they’re encapsulated inside of a Geo COMP. What does this mean? Well, it means that the noise SOP in our network is a CPU operation, and not a GPU operation and depending on your machine for this example your mileage may vary. Alright, so now we’ve made something awesome… but how do I use it?! 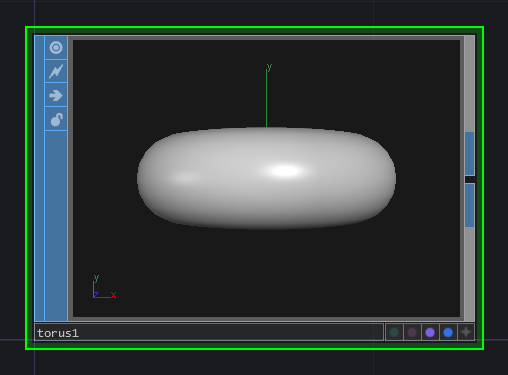 Well, in order to actually use something like this in a project we need to render this geometry. Rendering requires a few different things to be in place, we need something to render (a Geometry COMP), a perspective to render it from (a Camera COMP), and a light (a Light COMP, we don’t always need a light but for now lets add one anyways). Let’s start by adding those COMPs to the network. Nice work. You’ve not instanced your first set of geometry and rendered it. Now for extra credit, go back and consider changing some of your source SOPs… what happens if you change what’s in your Geo into a box or torus? What happens if you change your Sphere in the parent network into a grid instead? Happy instancing. This entry was posted in How-To, Programming, Software, TouchDesigner and tagged Arizona, Arizona State University, ASU, Derivative, Grad School, graduate school, instance, media design, programming, TouchDesigner, TouchDesigner Tutorial on April 23, 2014 by raganmd.